You can purchase the 41-page unit for Aliens on Vacation, The Intergalactic Bed and Breakfast NOW for immediate download for only $19.95! Includes a Jeopardy-type game. Imagine that you had just finished the sixth grade, and you were all set to have a fun summer of basketball with your buddies. Then, your parents break the news to you. You are going to get to go to Grandma's house just outside of Forest Lawn, Washington! The last time you saw her you were just a tot! By now she's got to be a hundred years old! What is there to do at her Bed and Breakfast? Answer to that's got to be, "NOTHING!" But, in what seems a blink of an eye, you arrive at Grandma's house. Immediately, you zero in on the sign out front: Intergalactic Bed and Breakfast and observe a ten-foot tall man eating aluminum foil and smelling her mailbox. What would you think? Inside you meet your grandma dressed in 60's hippie clothes and surrounded by Star Wars decorations. It isn't long until you discover that alien families (the kind with a hundred eyes surrounding their huge domed heads, or six arms, or tentacles) emerging from every closet in her Intergalactic Bed and Breakfast. Still think the summer's going to be boring? Guess who's going to have to pitch in to help the aliens have a great time? Guess who's trying to put a stop to the "funny business" that he senses at the inn? Guess what problems arise? Never mind. They are not guessable. We here at Kids Wings believe that Aliens on Vacation has got to be one of the best books ever written for kids of all ages. It has it all: depth of the characterization, an absolutely original plot, laugh-out-loud situations, a pretty girl, basketball, aliens, science, and lots of trouble! You will find a loyal, funny, clever, and imaginative friend in Scrub and a Grandma like no other! Hopefully, Disney (who has purchased the rights) will give you a terrific movie to look forward to when you reading finish the book, but we have to warn you: NO movie could even compare to this BOOK! So, teachers, order your class sets NOW! The Kids Wings unit will provide fun and interaction through puzzles, group projects, an original readers theater script, problem solving that builds skills, and a Jeopardy-type game for the whole class to enjoy at the end. Parents, order Christmas books for everyone on your list! Aliens, you will want plenty to take home with you after your one-of-a-kind vacation! A Kids Wings unit, perfect for lesson planning and handouts or projection on your SmartBoard for Aliens on Vacation is now available for instant download! 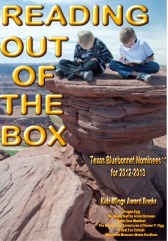 Aliens on Vacation, The Intergalactic Bed and Breakfast is included in the Kids Wings Reading Out of the Box collection of literature guides for award-winning novels and intermediate-level picture books. This collection comes in a spiral-bound book with CD and site license for one school. It contains 848 pages of activities in 25 titles PLUS a "Jeopardy-type" game for each novel! You can purchase a literature guide individually for around $19.95, but if you order Reading Out of the Box, you can get 25 literature guides for only $35, or less than $1.40 each! This is probably the best bargain in the USA, while quantities last! It's a great collection, super books, and excellent literature guides! A GREAT BUY! Buy Aliens on Vacation by Clete Barrett Smith NOW!